What is it? Building a civilisation takes careful planning with rulers needing to balance the need for raw and refined materials, protection for your people with a strong military force, as well as the development of your cultural and technological trees. Can you construct your wonder under the gaze of numerous leaders and lead your people to the golden era of their civilisation? We love wonderful things here at Cardboard Quest, so with 7 of them straight out the box we seem to be off to a good start. Its accolades are numerous; award winning game designer, Ludo, As D’Or and other European language awards and many mentions in gamers’ top 20’s, including that of the omnipotent Board Game Geek. So what makes the visit inside of the box so special to so many people? Is it simply something that you need to tick off your bucket list or one that’s majesty will hold the attention of generations? 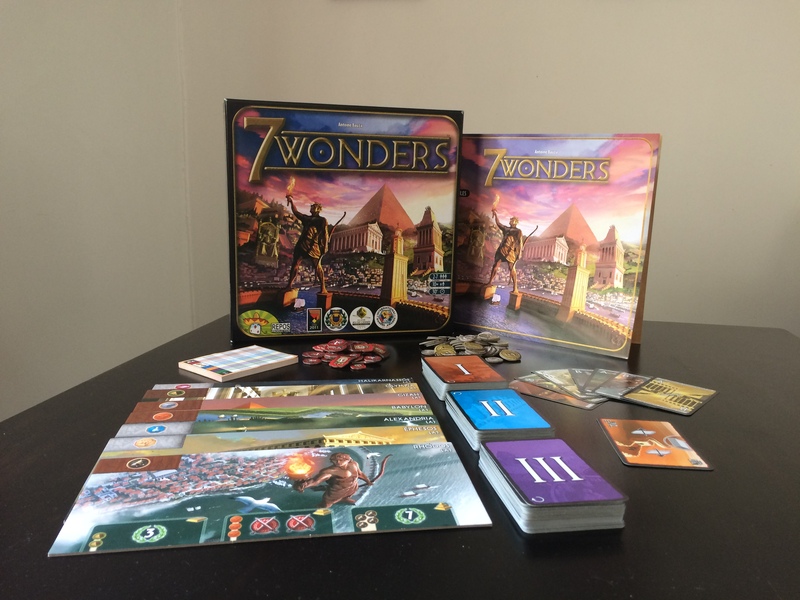 7 Wonders is a card drafting game from Repos Productions and designed by Antoine Bauza. 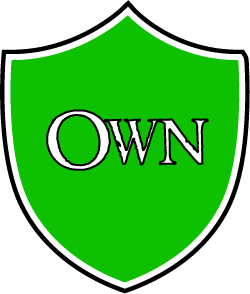 3-7 players will attempt to develop their civilisations and eclipse others by building advanced systems of commerce, unearthing vast resources of raw materials, recruiting blood-thirsty battalions of war, uncovering scientific truths, constructing civilian infrastructure and producing unique wonders across 3 ages. At the start of the game, each player draws a unique wonder from 1 of the 7 from the ancient world and gets given 3 gold coins with which to purchase resources. Each wonder has a specific starting resource for the player and effects that come into play when each of the three stages are built; these include victory points and special bonuses. In each age players will begin with 7 cards in hand take one of three actions and then pass the remainder of their hand to an adjacent player, either left or right depending on the age. 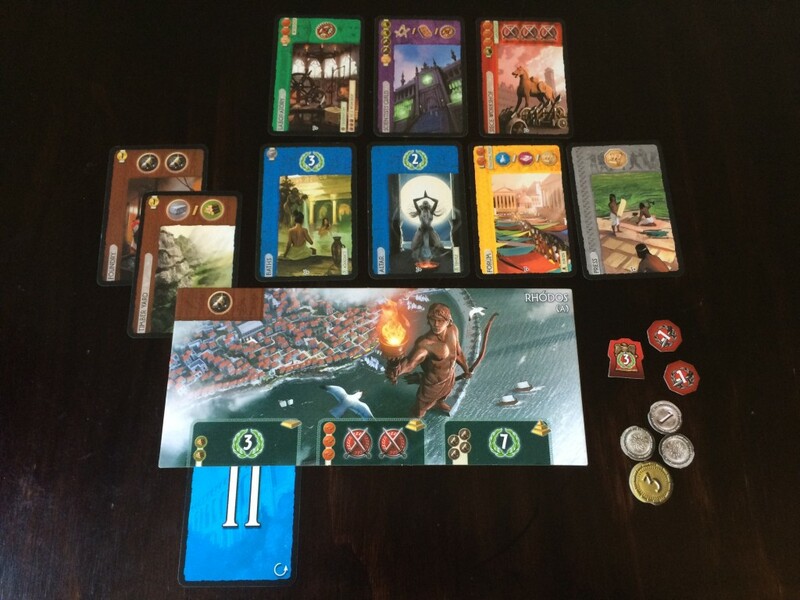 In each turn players will either – pick a card from their hand to add to their civilisation tableau by paying the resource cost, discard a card from their hand to gain 3 coins or commit a card from their hand to be used in the construction of their wonder by paying the required resources. When picking a card to add to your civilisation, players must pay the resource costs for the structure either from their available resources they already have, by purchasing the necessary resources from players to either their left or right, or free construction by having built the foundation structure in the previous age. Having built a laboratory, the Observatory and Siege Workshops can be built in later ages without paying the resource cost. Raw material cards (brown) and manufactured goods (grey) provide you with goods to be able to build structures in future turns by using their resources instead of purchasing from others, as well as being able to sell to other players to gain additional wealth. Civilian structure cards (blue) grant your victory points, Military cards (red) bolster your army strength and Commercial structures (yellow) grant you monetary and trading benefits as well as providing resources. Lastly Scientific buildings (green) allow you to chain numerous free constructions as well as providing victory points at the end of the game and Guilds (purple cards available only in the 3rd age) will offer large points to civilisations should they have the prerequisites of the organisations. Discarding cards can be strategic as well as lucrative if a player cannot make additions to their civilisation by denying other players the ability to chain free constructions or gain structures that would grant them too many victory points. Lastly, building your wonder allows you to remove a card that other players may want form the game (similar to discarding) and by paying the construction cost noted on your wonder board, grant you victory points or your special wonder bonus. Once players are down to a single card passed to them, the last card is discarded and the age ends. At the end of each age, players will compare military strength with the civilisations adjacent to them. For each victory, players will receive victory points that correspond to the age (1 for first, 3 for second and 5 for third ages) and for each defeat players will receive a -1 victory point. At the end of the third age victory points will be counted for all players. Players will total up points from military conflict, amount of money left in the treasury, the completion of their wonder, Civilian structures, the amount of scientific development, and lastly benefits from commercial and guild cards. The player with the most victory points is crowned ruler of the ages! 7 Wonders is a fantastic game to showcase the depth of the hobby to gateway gamers. While not strictly a gateway game due to a touch more complexity, it offers a surprising amount of depth with a multitude of winning strategies that allow players to adapt to other players as well as build their own path to victory. While the narrow choices of 3 actions prevent an overflow of analysis paralysis, there are numerous important choices you can make on each turn. If you’re finding your opponents battling it out for military supremacy, you can adapt to be the scientific leader and amass victory points through focusing on technological developments. If other players are hogging resource cards, simply invest in commerce to make your trading cheaper and if you’re not having luck with the above, Civilian structures are guaranteed victory points! Through offering a variety of options, players can focus on one or attempt to balancing numerous ones but will always feel that they have options and a multitude of strategies to victory. Another massive plus is the large player count that 7 Wonders welcomes without penalising groups with extended downtime for having more people join in. All turns feature simultaneous play, so the 45 min game time is essentially the same with 3 players as it is with the full 7, but the strategies employed in either game will vary greatly. Whilst no game is perfect, I fail to find many gripes with 7 Wonders. Scoring at the end of the game can take a little bit of time to calculate all scoring paths, however the suspense of not knowing the winners mid game keeps players interested throughout. With all the variations in strategies, sometimes options can seem a little overwhelming as well as the initial understanding of the various iconography of the cards for new players. With some of this variety, novice board gamers may take a couple of plays to understand the various options and how or when to execute the various strategies. It’s such a minor element for seasoned players but may be a bit of a stumbling block for beginners. That said, 7 Wonders is a game that would almost certainly find a place in any gamers’ collection. The flexible player count without downtime, simple yet strategic decisions each turn and production values of great artwork and functional insert make 7 wonders a game that you’d only pass on should you dislike the theme or mechanisms of card drafting and set collection, which would be completely irrational anyway. With quick setup, great strategies and the satisfaction of creating an ancient empire to trump all others, it’s my opinion that everyone should visit these wonders at least 7 times. It's no wonder this game is a firm favourite with families and friends alike. With several ways to earn victory points, simultaneous play allowing for more players with equivalent play time and an elegant game system that scales beautifully, 7 Wonders has a strong place at the foundation of your gaming collection. I just played 7 Wonders for the first time and I must say, this review hits the nail on the head. I went not knowing anything about the game. I was given some basic instructions, and with each rotation of the cards, my patient teachers gave me new insights. By the second age, I was beginning to understand the complexities involved in the decision-making. I quickly learned some strategies (such as burning cards that would benefit an opponent in exchange for coins), but also really paying attention to what my opponents were doing. In the beginning I was very focused on my own board, but I learned to keep a watchful eye. By the third age, I had a much better understanding of how the cards and general mechanics of the game worked, and I considered the different choices I would have made had I gone into the game with more knowledge. I will admit that into the first round I was slightly frustrated that I wasn’t capable of making the best strategic decisions because the game was foreign to me, but as I picked up some understanding of it, I think I did fairly well. I had the second highest score, having played with two more seasoned vets. We also played with the Leaders cards. All in all, loved it and want to add it to my collection. Excited to play again, and will probably check out a few sources online beforehand to gain fuller knowledge. Oh, and the boards are cards are just so visually pleasing. 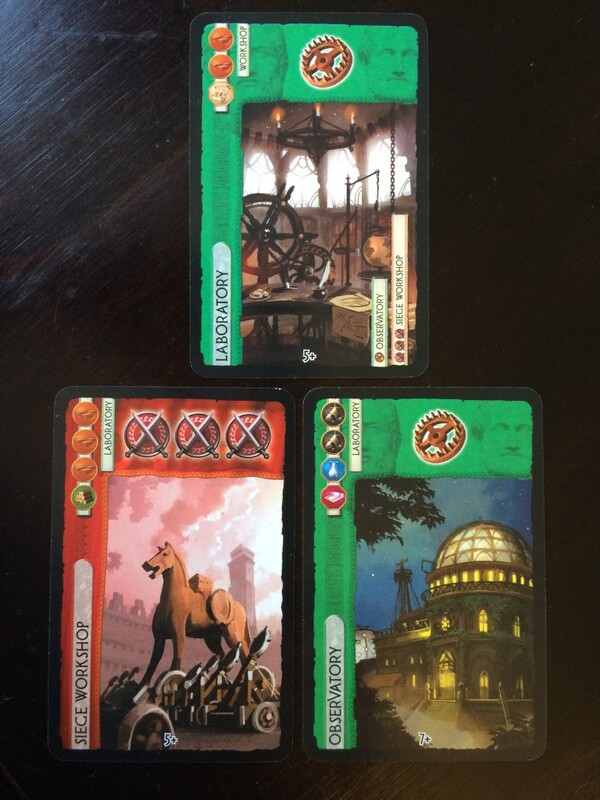 Also, we used a 7 Wonders App that calculates the scorecard for you – so we didn’t actually use the physically scorecards. It’s a matter of plugging in the numbers and letting the app calculate it.